« Jane Austen vs Charles Dickens Round Up! This entry was posted on June 10, 2011, 7:52 pm and is filed under Coming Soon. You can follow any responses to this entry through RSS 2.0. Both comments and pings are currently closed. oooh, oooh, my favorite classic author. I definitely want to be on this one Yay! How exciting! I have so many of his books I want to read. I’m looking forward to it. Oh! Yay! So happy about this one! 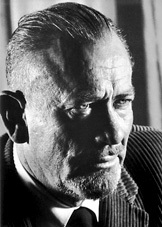 I’ve never read Steinbeck before, and I don’t that I’ll be able to read something by him by the time this tour begins. But I’m looking forward to touring the blogs and figuring out which one of his works I ought to start with. I will take a great interest in this and certainly try to join in ! The first time I read Steinbeck i didn’t love it, I then came to revisit it some years later and review my opinion. I haven’t read it for a while…..I love the Dickens vs Austen challenge ! Nice…very excited about this one. Now I have to decide if I want to try one of his lesser known works or do a re-read? Hmmm…so many choices!